Welcome to The Record Online! The Appellate Practice Section of The Florida Bar is pleased to bring you The Record in a new online format. The Premier publication about all things Appellate is now easier to read with more timely submissions. We are also in the process of uploading selected articles from archived editions of The Record, so they will be searchable and available here. In the meantime, you can access archived edition of The Record using the print archive link in the top right corner of the screen. Check back regularly for new content, articles, and announcements from the Appellate Practice Section! 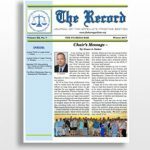 If you’d like to submit an article for The Record, please contact the Editor, Laura Triplett, at tripletl@flcourts.org.